Boating Season is 365 Days long! We took the LAIKA out for our first overnight voyage over the Memorial Day weekend. Leaving our marina Sunday morning at 9:30AM, we made it to the locks in about 40 minutes. Our lock-luck continued as we arrived at an open, green-light ready small lock. We scooted in and were in salt-water in less than 20 minutes. 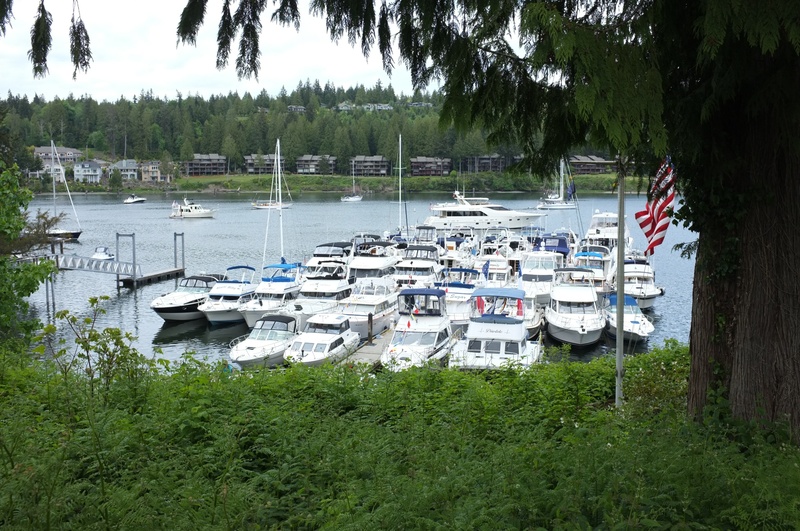 Our travel plans called for us to meet our boating club at Port Ludlow. So, I programmed the Garmin chart-plotter and asked it to compute a guided course. It did so and I zoomed in and reviewed the route to make sure it didn’t put us into any shallow waters or through obstructed areas. Then we were off. The trip to Port Ludlow was uneventful. Both seas and wind were moderate. I activated my Spot unit before we left so that we’d have a clear view of our journey and how long it took to arrive. You can see our path and the difference in speed between traveling toward and through the locks at 7kt and then zooming out and reaching 25+kt as we headed up past Kingston toward Port Ludlow. We arrived shortly after lunch. There were already about 35 boats rafted together off the club’s dock, which was recently upgraded to support 30Amp power for everyone. This was our first time rafting-up and it was fun. It was like a floating village with tiny swim deck filled paths joining boats to land. We were on the very outside on our row and had to navigate a few dinghys every time we headed for shore. The meetup was lots of fun. The evening we arrived there was a huge salmon dinner. 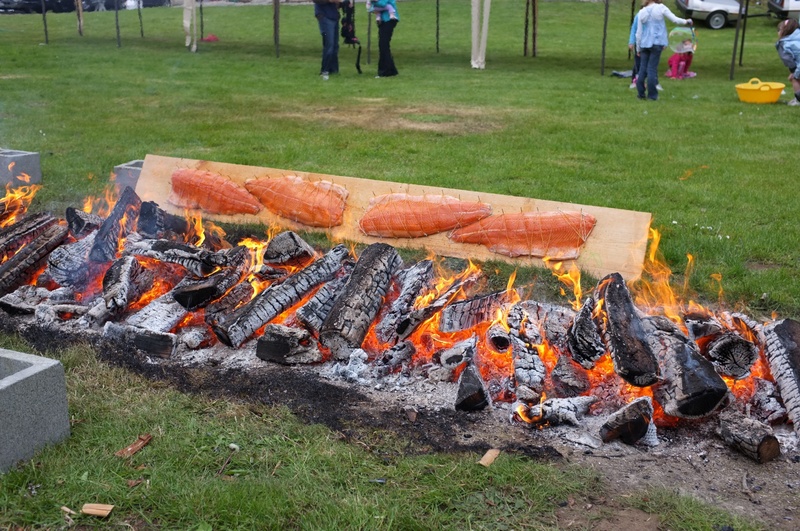 The salmon were fastened to planks and cooked at an angle next to a large outdoor fire. After dinner, dessert and roasting marshmallows we headed back to our boat for our first evening on board. It’s funny how the boat suddenly seemed so much smaller the moment we started involving overnight gear, bedding materials and sharing a single head. But, we made it – and it was certainly more comfortable than any tented experience we had endured in the woods! The one downside to an event where everyone is rafted together, and you’re the outside boat, is that you’re on the hook to leave early should your more “inside” neighbors decide they need to bug out early. After a quick fruit and coffee breakfast served at camp we prepared to leave, just as our neighbors were pulling up and cleaning out their dinghys. Since it was mid-morning and we had spent only one night out we decided to visit Port Townsend. 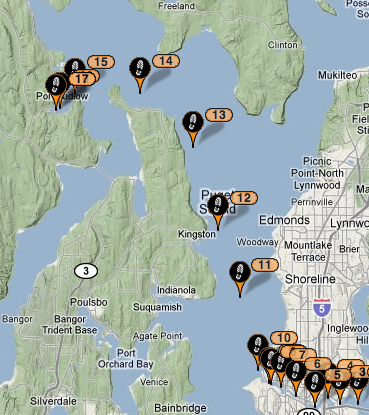 At 25+ knots it was a short ride from Port Ludlow. We were especially careful to plan a route around the rocks that sit at the entrance to Port Ludlow and face visitors coming in from the North. We had missed them entering from the South but now had to be aware of them as we planned our route toward Port Townsend. We enjoyed observing that the sea conditions matched exactly the referenced conditions on the charts. Where the charts said there were rip-tide like wave action we observed rip-tide wave action. Where eddies were reported to be we found eddies. 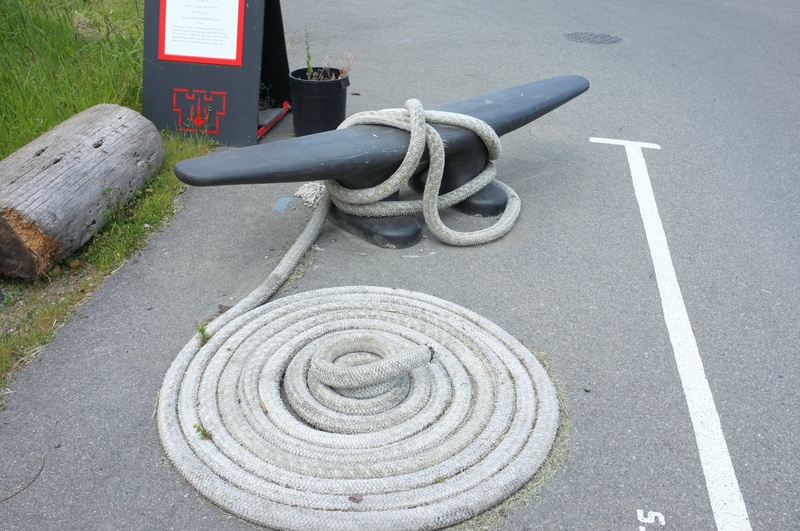 We arrived at Port Townsend and found temporary moorage only to discover that we should have gone to Port Hudson Marina instead. Located just about 1nm East of Port Townsend, Port Hudson Marina is where visitors go and is located directly next to the quaint downtown. Cathia knew this and had mentioned this before we had left Port Ludlow. However, my male genetic material kicked in and dictated that I refuse the use of any detailed maps or guides. On the plus side, we got to practice some additional slow-speed maneuvers. After spending a few hours in Port Townsend we departed for our return trip to Seattle. The ride back was also quite enjoyable. We witnessed what seemed to be small, black bodied porpoises between Port Townsend and the mouth of Hood Canal. We arrived back at the locks around 5:30PM. Once again, and, perhaps, surprisingly for the Memorial Day weekend, we encountered no lines – just a green light for the large lock which was about 60% full. We were directed in and told to raft up next to a slightly smaller powerboat. We had about a 20 minute wait in the lock as other boats were directed in and carefully arranged. I’ve enjoyed the half-dozen or so times we’ve been in the locks. It gives us a chance to meet and speak with other boater. 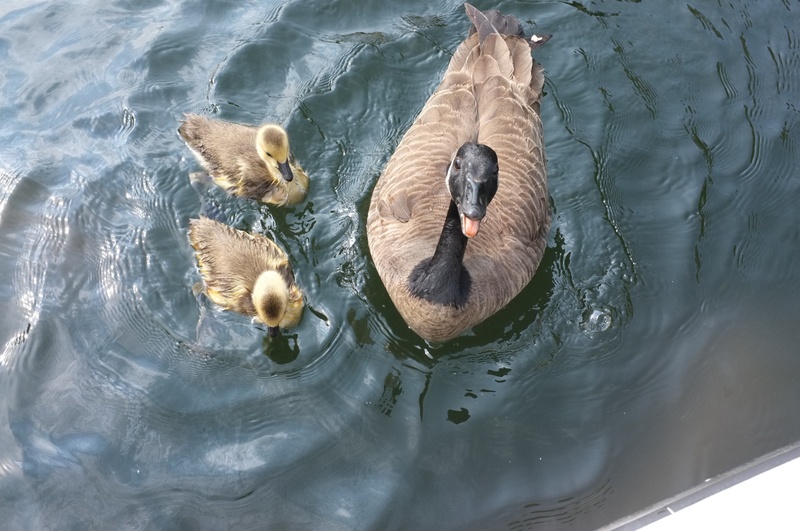 A family of ducks came by our swim deck and enjoyed the bread we passed to them. 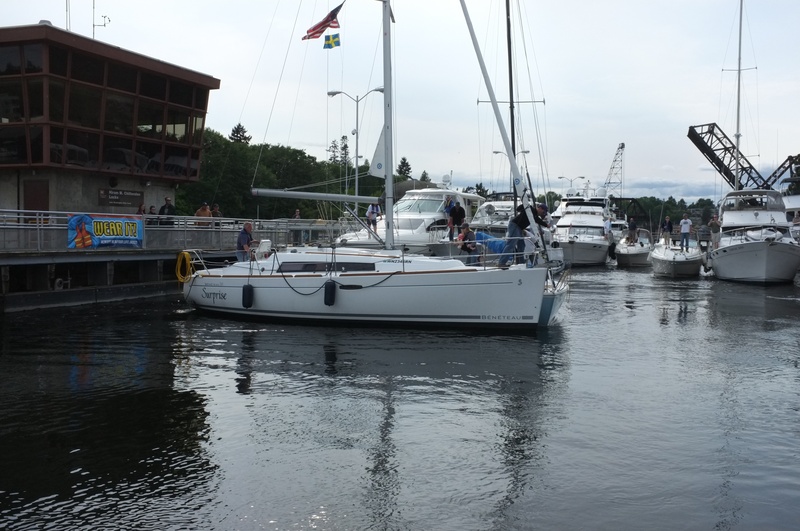 Once the lake side lock doors opened up and boats began receiving instructions from the lock staff one of the sailboats on our row lost control of their line. This caused them and a smaller sailboat that was tied to them to begin floating out of control toward our boat. Who was at fault? From my perspective the Beneteau’s captain. While he claims the boat he was rafted to may have released his line prematurely, it was his responsibility to secure and manage his own lines. That’s why lines are circled through other boats rather than simply giving them one of the ends and expecting them to be properly tied. There’s nothing we could have done to have prevented his accident. The event didn’t really damped the excellent memories we had and we look forward to our next adventure on board the LAIKA. David is a Seattle-based technology entrepreneur. He's created several successful companies. He's an avid boater and enjoys spending time with his wife, daughter and Australian Shepherd aboard MV KAYLA in Lake Washington and Puget Sound. He's also a volunteer Firefighter / EMT and enjoys sharing his knowledge of safety and life-saving skills with fellow boaters. Sorry to hear about the Surprise attack. Sounds like a great experience. Thanks for sharing it with us. If the picture is what you referred to as “ducks” is what you were feeding, that looks suspiciously like a Canadian goose family. Sounds like a successful trip regardless, thanks for sharing! Which yacht club do you belong to? My brother is a member of QCYC. Our father joined it in about 1956. I now live in Colorado so I haven’t gone boating in many, many years. Still dream that one day we will tho’. Have many fond memories of Port Ludlow.